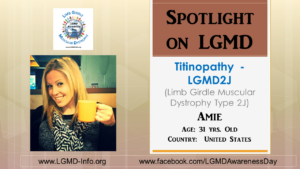 I was just diagnosed at the age of 31 with LGMD2J – also known as Titinopathy. I have always had problems with my legs and walking, but was always told that it was from short Achilles tendons. After having surgeries to lengthen them, my calves atrophied. My core muscles seemed weak & I always thought it was from having two C-sections. It wasn’t until this year that my body took a drastic change in becoming weak and I couldn’t ignore it anymore so I made it my mission to find answers. No known family members suffer from this disease. My LGMD has many challenges. I struggle every day with “normal” daily activities: walking across a room, standing up from a seated position, going up a step or uphill, climbing into a truck, bending down, balancing etc. It can be frustrating at times. I miss out on a lot because of the constant pain I feel. If I do too much (which doesn’t take a lot), it will put me down for days. I have to pick and choose what is important and what is not. All of this affects my family’s lives as well which I carry the burden for. LGMD has definitely taken some of my freedom which is hard to deal with, but I try to keep a positive mindset! My greatest accomplishment is being a mom, wife & sister! I have two beautiful daughters, an amazing husband & the most supportive family anybody could ask for. They are the reason I stay positive and “fight like a girl”! All my life all I ever wanted was to be a mom and have a loving family! I am definitely blessed! Though my diagnosis is fairly new, I always knew something was wrong deep down. I actually self-diagnosed myself with LGMD before getting a diagnosis from my neurologist. So when the test results came back I felt an awkward sense of joy. I finally had a diagnosis! I feel like I have been given this disease for a reason that I haven’t found an answer for yet. I truly believe everything happens for a reason and timing is everything. 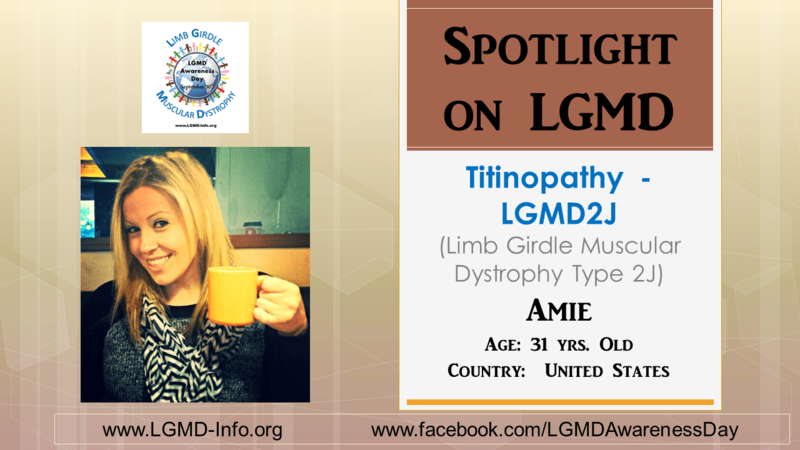 LGMD is such a rare disease that is definitely unknown in my area so I am going to research as much as possible and advocate to as many people as possible. I know that I am strong even though my muscles aren’t. I enjoy the little things in life and live in the moments! I also seek the positive in every situation. Life is too short to focus on the negative! I want the world to know that 1 in 43,000 people have Limb Girdle Muscular Dystrophy. Unfortunately there is no cure for this disease. Due to its rarity, there is less funding for research which keeps me further from receiving a cure. LGMD can creep into any family & it effects lives on a daily basis. Eventually I foresee this disease taking my ability to walk, but I am going to fight it as long as I can! Where do I start? I would take my daughters to Disney World and then hiking in Colorado! I would walk up a flight of stairs just because I could! I miss the little things I use to do like shopping, dancing or even taking a bath! You don’t realize the freedom you lose until it’s gone!